What are the Special Qualities of Natural Casings ? For Sausage Makers, these characteristics yield high quality products that are uniform in flavor. For Retailers, the endothermic quality of Natural Casings means that the casing draws heat from the sausage and cools it below the temperature of surrounding air, providing better shelf-life and maintaining a juicier, fresher appearance. For Consumers, the osmotic quality allows an intermingling of flavors inside and outside the sausage while sizzling in the skillet. It also allows the wonderful scent of fine sausage to enhance appetite appeal, whether cooking in a skillet, under a broiler, or over an open flame on the barbecue grill. Natural Casings (a definition): Natural Casings are made from the submucosa, a largely collagen layer of the intestine. The fat and the inner mucosa lining are removed. Since small intestines are collagen in nature, they have many of the same characteristics common to all types of collagen, particularly the unique characteristic of variable permeability. Natural Casings are hardened and rendered less permeable through drying and smoking processes. Moisture and heat make casings more porous and tend to soften them, which explains why smoking, cooking and humidity must be carefully controlled. Fresh sausage is made from chopped, ground, or even pureed uncooked meat. It usually, but not always, needs to be refrigerated until used. Cooked sausage (or pre-cooked) like hot dogs, frankfurters, bologna, mortadella, and many German-style "wursts" are usually made with smooth, even pureed fillings. Although these sausages are always cooked after filling, sometimes the fillings are partially cooked before being stuffed into the casing. These sausages are still heated up or cooked by the consumer to bring out the best flavor. Smoked sausages like andouille, kielbasa and cervelat can be eaten as-is, heated, or cut up and used in other dishes. 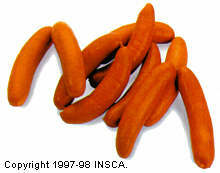 Cured or dried sausages are sausages made fresh and then salted and air-dried for some time, depending on the type. For well over 2000 years, sausages have been created to preserve meat. Without the modern technologies we enjoy today such as refrigeration, meat was cured or dried, and packed in natural casings to prevent it from spoiling. This allowed it to be stored for later use. The meat is cooked by the salt and air over time. Spanish chorizo, coppa, and Genoa salami are just a few examples of cured sausages. Together, the casing supplier and sausage manufacturer can determine the criteria to be used when ordering, testing and inspecting the casing.